Needless to say we are very lucky to get a lot of stuff around here. We try it, we blog it, and we (usually) move on to exploring the rest of the beautysphere. But not so with NERD Skincare. Some rare things make it to permanent rotation, and these geeks have done it. 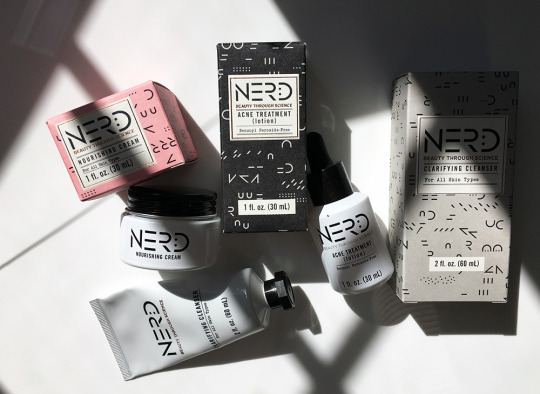 NERD sort of reinvented acne care for me (and I needed it). Instead of drying treatments with the usual skin-sloughers (salicylic acid, benzoyl peroxide), NERD created ingredients that encourage skin’s natural bacteria (S. Epidermis) to produce short-chain fatty acids that naturally fight acne. I think this is what people mean when they say pro-biotic … but in any case, it works. I never say this stuff even though I write a beauty blog - but their regimen made my skin better than ever. It made it pretty amazing. I am in love. Created with 100 percent plant-derived ingredients, NERD’S Clarifying Cleanser is for all skin types and removes dirt and oil without leaving your face feeling dry and crackly. It’s creamy and barely foamy, and it feels so good. Next step: NERD Acne Treatment (lotion) is a clear liquid that looks and smells like nothing. You pat it on your face in a friend way, and it goes to work clearing acne using your own immune system. It takes 3-7 days to see results and truly, I swear by it now. Lastly, and contrary to your instincts if you have acne, use the Nourishing Cream. It’s designed to repair damaged skin and accelerate wound healing for popped pimples (NERD literally includes a guide to how to effectively pop, which is smart, because even a derm office does it). I feel like this cream gave me permission to moisturize and I totally understand how it works because I also use Mederma on my zits, which is a lotion formula too - in any case it all works to help the redness fade and healing speed up.